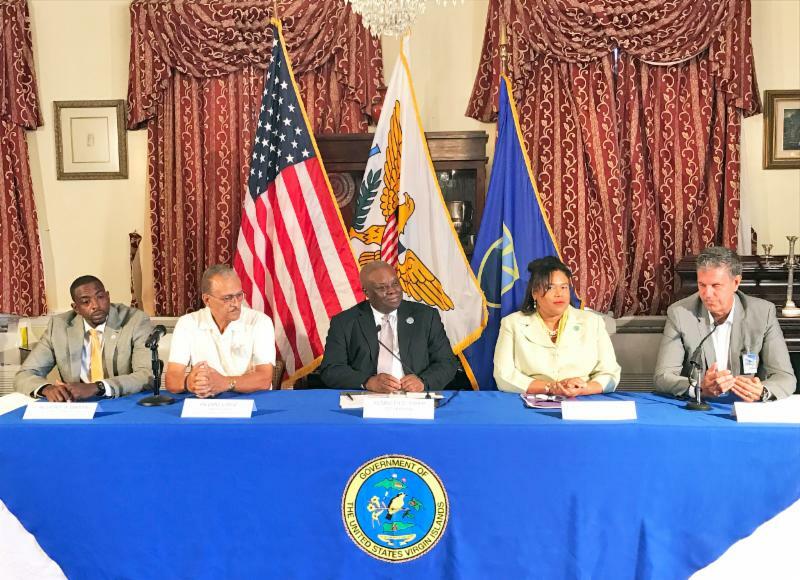 From left: Assistant Commissioner of Sports, Parks and Recreation Calvert White; Commissioner of Sports, Parks and Recreation Pedro Cruz; Governor Kenneth E. Mapp; Tourism Commissioner Beverly Nicholson-Doty; and Basketball Travelers Executive Director Nels J. Hawkinson at Friday morning's news conference at Government House on St. Thomas. U.S. VIRGIN ISLANDS (May 26, 2017) - The United States Virgin Islands is now an approved destination to host National Collegiate Athletic Association (NCAA) Division I teams and, in addition to hosting basketball, volleyball and swimming events, the Territory can facilitate the participation of soccer, lacrosse and other NCAA-sponsored sports during the summer months. Governor Kenneth E. Mapp said the new designation represented a huge boost for sports tourism opportunities in the Territory. He made the announcement Friday at a news conference at Government House on St. Thomas, where he was accompanied by Commissioner of Tourism Beverly Nicholson-Doty; Commissioner of Sports, Parks and Recreation Pedro Cruz; Assistant Commissioner of Sports, Parks and Recreation Calvert White; and Nels J. Hawkinson, Executive Director of Basketball Travelers, Inc., which runs the USVI's annual Paradise Jam basketball tournament in November. "With all 24 NCAA Division I sports teams now able to travel to the U.S. Virgin Islands for summer tours, we look forward to being part of the growth of the Paradise Jam competitions and to the possibility of hosting other NCAA sporting events," the Governor said, recognizing the potential for a significant positive impact on the Territory's economy. "This is an amazing opportunity to expand our sports tourism portfolio and our facilities." 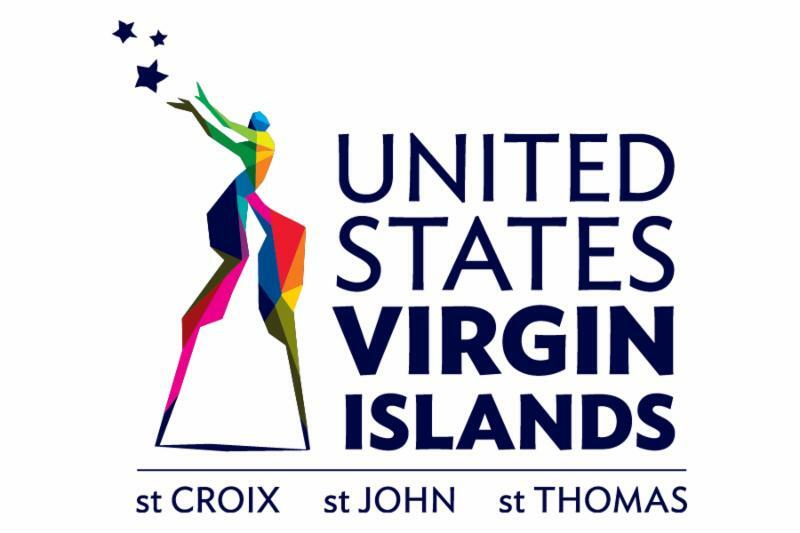 The USVI and Basketball Travelers have partnered to bring five men's college basketball teams to the Territory as early as this August now that the USVI has been approved as an international or foreign tour destination for Division I colleges across the United States. Hawkinson, whose Basketball Travelers organizes both domestic and international basketball competitions for college and high school teams, said there are 340 Division I universities in the United States, each with approximately 25 sports with 50 potential teams (men and women combined) that can now visit the islands. "We're very excited to build on the success we've had for the last 18 years with Paradise Jam and to bring additional teams here. We're looking forward to this new initiative and continuing our great partnership with the U.S. Virgin Islands and its people," he said. Currently visiting the U.S. Virgin Islands for the 50th time, Hawkinson said his love affair with the Territory is still as strong as it was 20 years ago when he first visited on a cruise ship. "That's what makes your islands. Everywhere I go (people) are friendly...and it's so wonderful to know that when we bring groups here that people are friendly and they understand basketball and sports." Three U.S. Division I schools, James Madison University, the University of Northern Colorado and Vanderbilt University, will visit the Territory this August for the Paradise Jam Summer Tours, along with Canada's Carleton University and Brock University. "This partnership opens doors for new business in the summer and fall, with the potential to host more basketball teams and athletes in other areas," Commissioner of Tourism Beverly Nicholson-Doty noted. She added the Tourism Department has been hard at work developing marketing strategies specifically for college and university audiences. The Commissioner said sports teams comprising 15 to 20 visitors are being encouraged, explaining that Paradise Jam, through its basketball competitions in the fall, currently produces $2.4 million in direct economic impact and more than $6 million in media exposure. "The event has a 22:1 return on investment for the U.S. Virgin Islands, so we are looking forward to this opportunity to have many more types of these sporting events as we build our sports tourism network." The Paradise Jam Summer Tours, which allow visiting teams to experience the natural beauty of the USVI while playing competitive out-of-season games against international opponents, will feature basketball games on St. Thomas, and for the first time, on St. Croix. In addition to the five teams traveling to the Territory, the USVI National Team will compete in the summer tours, marking the first time in 15 years the national team will compete in the islands. The team's first faceoff will be the opening game of the Paradise Jam Summer Tours on August 13, on St. Croix against Vanderbilt University. Assistant Commissioner of Sports, Parks and Recreation Calvert White, who is working directly on the initiative, said that in light of the unprecedented success of the Paradise Jam Basketball Tournament and the growth of the sports tourism market, the Department of Sports, Parks and Recreation looks forward to strengthening its partnership with the Department of Tourism and Basketball Travelers. For more information about Paradise Jam and Basketball Travelers, visitparadisejam.com and basketballtravelers.com.